Béatrice was born in Esch-Alzette, Luxembourg, in 1999. She started her musical education when she was 7 years old at the regional music school of Dudelange with Bob Morhard. Beside her lessons in classical percussion and chamber music, she also played the drumset for several years. In September 2016, she also started playing the piano and Jazz-vibraphone. In 2010, Béatrice won the 1st prize at the Snare Drum PLUS competition of the Axent Asbl, which gave her the chance to perform with the Luxembourg Military Band. She participated in the Concours Européen pour Jeunes Solistes three times. In 2010 she played the marimba, in 2015 she played the vibraphone and in 2016 she reached the 3rd place when she played percussion solo. 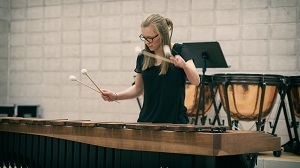 In 2016, she took part in the Zeltsman Marimba Festival On Tour in Dudelange, where she attended masterclasses with Nancy Zeltsman, Rachel Xi-Zhang, Laurent Warnier, Fumito Nunoya, Pedro Carneiro, Jack Van Geem and David Friedman. Béatrice attended several other masterclasses with international percussionists like Emmanuel Séjourné and Sylvie Reynaert, and she also worked with Tatiana Koleva, the Playmobeat Drum Trio and the Circle Percussion Group. Besides, Béatrice was involved in the orchestra of the Luxembourgish Musical of the UGDA “De Simmerfluch” in 2015 and she has played with the Estro Armonico Chamber Orchestra several times. Furthermore, she participated in the EMUSIK Festival in San Sebastian, Spain, with a percussion ensemble from Luxembourg in 2016. Since 2012, she has been a member of the HMD – Harmonie Municipale de Dudelange. If you are interested in working with Béatrice, please get in touch with the EMCY Office.